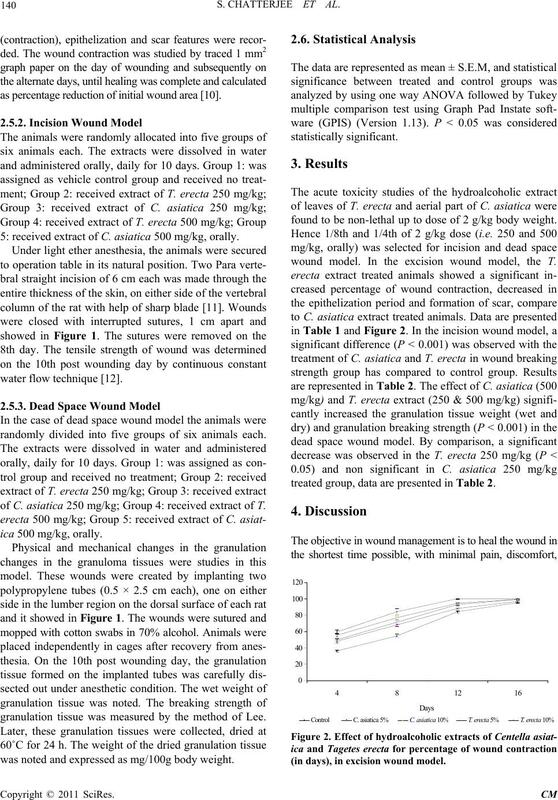 potent wound healing activity then the reported C. asiatica in different wound parameters. ocess. Have regenerating dermal and epidermal tissues. nalool tagetone, n-nonyl aldehyde, lutein . plants has been deposited in the department. alcohol-95% and 150 ml water) at 65˚C to 70˚C for 24 h.
dried mass were recorded (Yield: C. asiatica-10% and T.
standard pellet rat chow (Pranav agro industries Ltd.
randomly allocated into five groups of six animals each. cream having C. asiati ca (10% w/w). Figure 1. Different surgical w ound models on r ats. as percentage reduction of initial wound area . 5: received extract of C. asiatica 500 mg/kg, orally. randomly divided into five groups of six animals each. of C. asia tica 250 mg/kg; Group 4: received extract of T.
granulation tissue was measured by the method of Lee. was noted and expressed as mg/100g body weight. found to be non-lethal up to dose of 2 g/kg body weight. wound model. 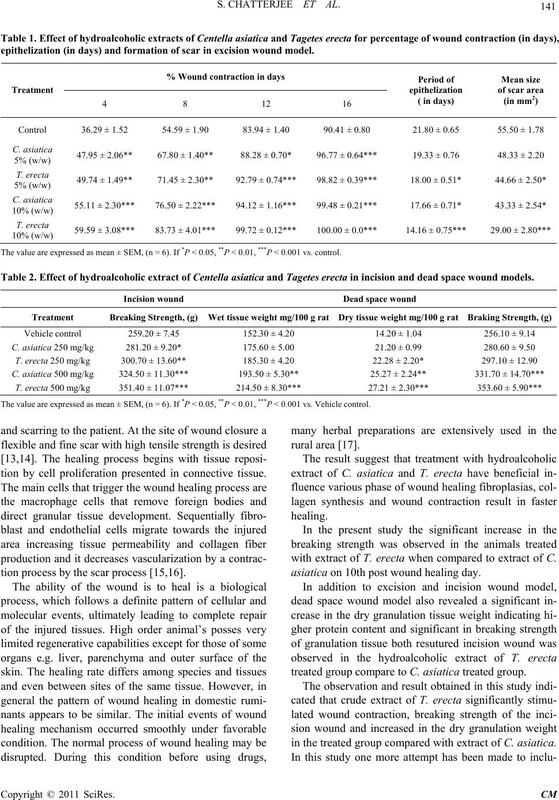 In the excision wound model, the T.
treated group, data are presented in Table 2. (in days), in excision wound model. 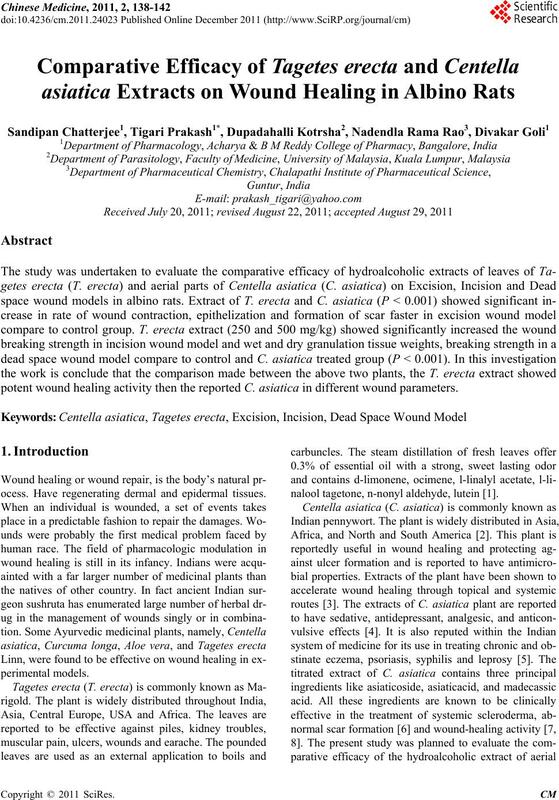 epithelization (in days) and formation of scar in exci sion wound model. The value are expressed as mean ± SEM, (n = 6). If *P < 0.05, **P < 0.01, ***P < 0.001 vs. control. Table 2. Effect of hydroalcoholic ext ract of Centella asiatica and Tagetes erecta in incision and dead space wound models. The value are expressed as mean ± SEM, (n = 6). If *P < 0.05, **P < 0.01, ***P < 0.001 vs. Vehicle control. tion by cell proliferation presented in connective tissue. tion process by the scar process [15,16]. with extract of T. erecta when compared to extract of C.
asiatica on 10th post wound healing day. treated group compare to C. asiatica treated group. in the treated group compared with extract of C. asiatica. in folk medicine is justifiable. stant support and facilities to this study. Healing Activity of Tagetes erecta Linn Leaves,” 2004. Vol. 11, 1998, pp. 466-474. Vol. 11, 1998, pp. 508-520. Planta Medica, Vol. 55, 1989, pp. 339-348.
nal of Dermatology, Vol. 32, No. 3, 1987, pp. 63-67. Pharmacal Research, Vol. 28, No. 4, 2005, pp. 502-508. A. Shukla, A. M. Rasik, G. K. Jain, R. Shankar, D. K.
Wounds, Vol. 5, 2006, p. 136. Acute Oral Toxicity,” OECD, Paris, 1993. p. 401. 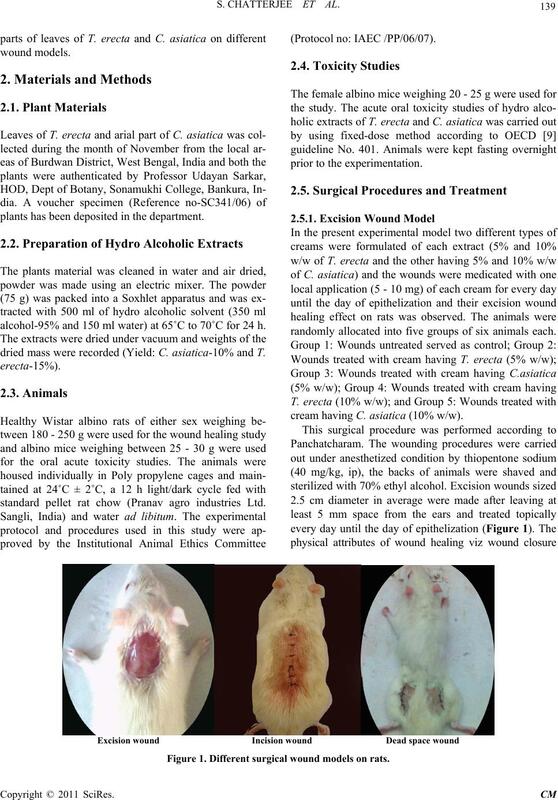 Wounds,” British Journal of Surgery, Vol. 170, 1969, pp. 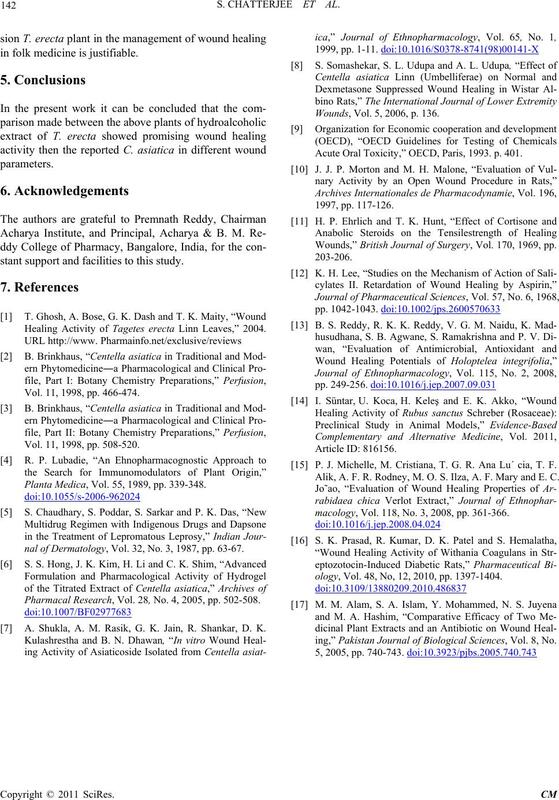 P. J. Michelle, M. Cristiana, T. G. R. Ana Lu´ cia, T. F.
Alik, A. F. R. Rodney, M. O. S. Ilza, A. F. Mary and E. C.
macology, Vol. 118, No. 3, 2008, pp. 361-366.
ology, Vol. 48, No, 12, 2010, pp. 1397-1404.
ing,” Pakistan Journal of Biological Sciences, Vol. 8, No.